Tonight! I tear myself away from Super Smash Bros. Ultimate long enough to report the news on this edition of Multiverse Tonight! Merry Christmas, Feliz Navidad, Good Solstice and Welcome to Episode Fifteen of Multiverse Tonight, I’m your host, Thomas Townley.This episode was recorded on December 18th, 2018. Thank you to all of you who listen. Especially those in far away places like Scotland, Sweden, Poland, Australia and Hong Kong. It’s a thrill to see these countries in my stats and I hope to get more fans worldwide, so please share us with others.By the way, I am now streaming the live recording of the show on Twitch. I usually record the show between 1 PM and 2 PM Central time on Tuesday afternoon and it will be archived there and on Facebook as well, if you wanna see me record the show. By the way, if you really want to help me out like my good friend Ann, you can tip me via Ko-fi, Patreon and now directly from the Radio Public app and Buzzsprout player. Starting off with Star Wars news is an item that I’m gonna guess means something to someone. Ed Sheeran, according to The Sun UK, the multiple award winning singer will cameo as a Stormtrooper. Now there is zero confirmation for this rumor so maybe it’s true and maybe it isn’t. If the first order is nothing but singers, the Resistance might have a pretty easy time of it. Speaking of rumors and episode nine, another rumor has BB-8 getting his own sidekick. According to a report on MAking Star Wars, Star Wars 9 will see BB with the sidekick described on reddit as quote “sort of a sidekick to BB-8. It’s little and has sort of a cone-shaped head, kind of like a megaphone shape if you can picture it.” The post also claimed that the droid’s name was “Dio,” which could also mean its name was “D-O.” The report on Making Star Wars added that that the new droid was sort of an ugly duckling that treated BB-8 as it’s parent. And while we’re in deep rumor territory here, according to yakfaceforums.com Force Friday, the big marketing push for episode 9, will be October 4th of 2019. It should be noted that Frozen 2’s big merchandise push also comes on October 4th, so plan accordingly. First round voting for the academy award for Original song and original score is underway, but four scores have been told to hit the bricks, Music for “Solo: A Star Wars Story,” “Green Book,” “Mandy” and “The Other Side of the Wind” has been disqualified for various reasons, the reason that Solo was disqualified? It was entered too late. Guess Disney had better things to do than put a stamp on that envelope. According to Star Wars dot com, quote “Thrawn has been one of the Empire’s most effective instruments, pursuing its enemies to the very edges of the known galaxy. But as keen a weapon as Thrawn has become, the Emperor dreams of something far more destructive.”Now, as Thrawn’s TIE defender program is halted in favor of Director Krennic’s secret Death Star project, he realizes that the balance of power in the Empire is measured by more than just military acumen or tactical efficiency. Even the greatest intellect can hardly compete with the power to annihilate entire planets. 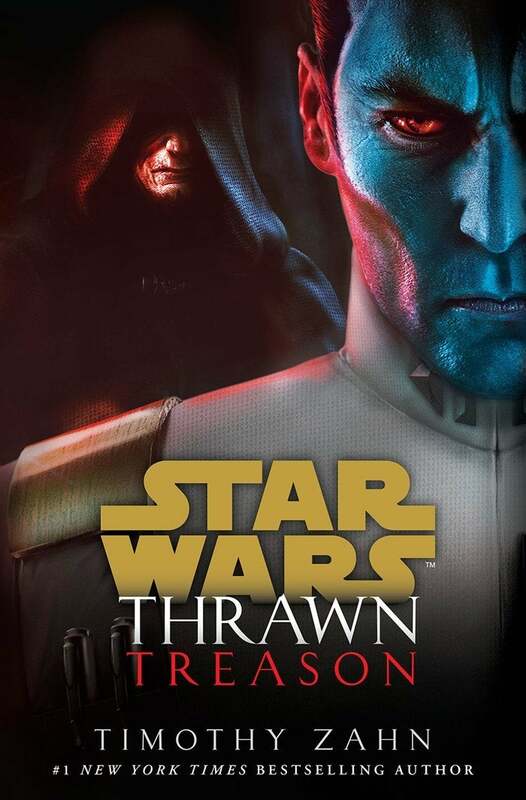 Ya know, it’s a shame that Disney and Lucasfilm don’t want to make more one off films, I think a Thrawn film would be interesting, plus it would put him back in the main cannon after he and the rest of the expanded universe were put into the Legends cannon, which means that he’s no longer officially part of the main universe. The series come from writer Dennis Hopeless with artist Paolo Villanelli on issue one and Brian Level joining in on issue two. Star Wars Vader Dark Visions will take Vader to the darkest parts of the galaxy. The story will begin with a story that will quote shed a new light on the many sides of the galaxy’s greatest villain.” This series comes after the regular vader series ends with issue 25 and the cancellation of Chuck Wendig’s limited series Shadow of Vader were cancelled. Anyway, This month’s Star Trek short Trek aired and it was about Saru and how he contacted Starfleet, it was nice…incomplete, but nice. Now we have word from the writers to how this story fits into cannon. Speaking with Syfy Wire, writer Erika Lippoldt said that the episodelet takes place about 1o years before Burnams flashback in the battle of the binary stars That flashback took place in 2248, placing this short in or around 2238. Saru made some amazing progress going from something of a talking thinking cow to a berth on a starship. However, I’m gonna guess that his family has been eaten by now. Speaking of Discovery, we’re gonna see a bigger story than previously indicated Anson Mount on a tour of the Ticonderoga, new york original series set for the Christmas with the Captains event revealed that the episode count will increase by one to 14. No confirmation from CBS as of yet. But here’s hoping it’s a long drawn out episode about Sybok. Our second tidbit of news is about the filming of the new series, as you may know, Discovery is filmed in Toronto Canada, the Hollywood of the North well, California, in a bid to lure back some of that production to the USA (USA, USA)is giving CBS Studios a sizable 15.6 million credit to help defray the cost of production. I’m betting Ferengis with briefcases were standing by for the money from the hu-mons. A new book in the Star Trek Little Golden Book line is coming in 2019.Following I Am Mr. Spock and I am Captain Kirk in January comes Too Many Tribbles, inspired by The Trouble with Tribbles comes from author Frank Berrios and illustrator Ethen Beavers. The blurb for the book is as follows: Captain Kirk and the crew of the starship Enterprise are ready for almost anything–except tribbles! When these small, furry creatures invade the ship, Captain Kirk and the crew must act quickly, before they are buried in fur balls! Star Trek fans of all ages will love this action-packed Little Golden Book featuring Captain Kirk, Mr. Spock, and the rest of the crew from the classic TV series in a unique retro art style! Too Many Tribbles comes out in July. Avengers Endgame is on track to meet Infinity Wars box office take with some analysts saying it could hit two billion in worldwide and 600 million in the US. INfinity Wars brought in over 678 in the US and about 2.5 billion worldwide. The film will be under pressure to cross that mark as a month later Godzilla 2 comes out. Tony Stark’s plight in the Endgame trailer has people asking NASA on social media to save Iron Man. Here’s a few that comicbook dot com found @yeheypizza quote Hello Mr @NASA can you please rescue Tony Stark he’s stuck somewhere in outer space and his food and water supply ran out four days ago his oxygen levels are depleting WE DON’T KNOW HOW LONG HE HAS BEFORE HE DRIFTS OFF PLEASE unquote @charliehunter91 quote @NASA while you guys are having fun with your family & friends, Tony Stark aka Iron Man is stuck somewhere in space. Please go and rescue him. PLEASE HURRY !! So forget Space Force, Let’s save Iron Man! Or we could just wait for Captain Marvel to save him. Uber Fanboy and filmmaker Kevin Smith has seen Infinity War a lot …..Mr. Smith dropped by IMDB for their Best of 2018 roundup and revealed that Infinity War was his favorite movie of 2018 admitting that he’s watched it forty eight times. Saying quote “That is the absolute closest I’ve ever seen to a comic book coming to life,” I think we can agree to this. Now will Endgame blow Kevin’s mind? Marvel Studios released the first trailer for Spiderman far from home…far from home at Brazil’s CCXP conference a few days ago. Unfortunately, they haven’t released it so the rest of us to enjoy, but we do have some reports about what it contained. We will see our friendly neighborhood Spider-man on an overseas school trip to Europe and wouldn’t you know, trouble breaks out and he left his suit at home. Luckily, Nick Fury shows up to recruit Peter telling him that creatures called Elementals are creating havoc and he gives Spidey a stealth spidey suit and a partner, Mysterio. Sounds good. Now if they would just release the trailer so we could see it? After Netflix cancelled Daredevil, Luke Cage and Iron Fist, you might have thought that they’ll return on Hulu or Disney’s new Disney Plus venture…well, just in time to burst your bubble comes a report from Variety that the deal between Marvel Television and Netflix contains a clause that says the the characters from these shows can’t appear on any non Netflix series or film until two years after cancellation. This means that if you wanna see a new Daredevil series you’re gonna have to wait till 2020. Sorry Charlie. Speaking of Marvel on Netflix, not cancelled….by the way this means that if this is cancelled after it’s next season it won’t be available until 2021. The Punisher is scheduled for release in January..no date has been forthcoming. 20th century fox has revealed that the pg-13 version of Deadpool 2, once upon a deadpool will count toward the overall gross of Deadpool 2 and not act as a seperate movie. Deadpool 2 brought in 734.2 million with it’s initial release. It’ll be interesting to see what the pg-13 adds to the total for the sequel and if this will be something that Fox will want to do with any future releases. “I just want to Spider-Ham’s shorts,” “I want to spin off the Spider-Ham cinematic television universe.” Even if he was just joking, Lord said that he did not want to get ahead of themselves before the film released in theaters. I guess only Ham will tell. We start DC News with an interesting development, last episode I told you about a Blue Beetle movie being put into development, well now we get a new movie. Plastic Man. A report in the hollywood reporter says that Amanda Idoko will pen the script for executive producer Robert Shaye and is described as a comedic action adventure…could this be DC’s answer to Deadpool? Plastic Man did start out as a criminal before he fell into a vat of chemicals and becoming a superhero. And since the movie is in development, there’s already interest in the part. Actor Ben Schwartz of Parks and Recreation and House of Lies tweeted out quote I’ll start stretching now just in case. Unquote Ben first expressed interest in the role back in April. Also interested in the role is Venom star Reid Scott s also interested in the role. May the stretchiest man win. Before we get season four of Lucifer on Netflix, we got word from showrunner Ildy Modrovich that seasons 1 through 3 will be available to stream on the streaming service. He tweeted: “They’re going to make seasons 1-3 available before S4 so everyone can rewatch and new folks can catch up. And we’ll have exact release dates for both SOON!! Hang tight :)” Good, cause I have still have season two and three to catch up on. So much geeky things, so little time. Take a moment to take in the full name of the Birds of Prey movie again. Birds of Prey (and the Fantabulous Emancipation of One Harley Quinn). You know that this will never see a marquee in full. Most likely it will be shortened to Birds of Prey and harley Quinn or just Birds of Prey To answer how we got to this looooooong. Title, screenwriter Christina Hodson spoke to Collider in an interview quote “I don’t know if I’m officially allowed to say, but there’s no reason why not.”. “It was an unofficial aka, when I wrote the script. I added it about a year or so ago, almost exactly as it is, just as an aka. I didn’t think we’d ever use it. We’d always used a working title, so I just had it as a cheeky little thing, on the front cover. And then, when we were talking about a title and brainstorming, we all kept drifting back to that one.” I wonder how they got the studio to go along with this However star Margot robbie’s into it. Quote “I love a long title.” Robbie explained. “I said that when we were trying to come up with the title, ‘Did you ever see The Hundred-Year-Old Man Who Climbed Out of the Window and Disappeared?’ …It’s a long title, but I love it.” Maybe we can initialize it? BoP:FEOHQ….maybe not. Aquaman star Amber Heard wants to see Mera team up with another dc legend. Speaking with the Hollywood reporter she said quote “I would really love to team up with Wonder Woman. That would be a kickass duo right there,” “But I’m vying for a spinoff, right? You heard it here… Mera and Wonder Woman spin off. Go for it, Warner Bros.” Now considering that Aquaman and Wonder Woman might just be the two best spinoffs of the DCEU, this might not be a bad idea. Perhaps this idea should be pursued. Industry experts are looking at Aquaman’s opening weekend to bring in 65 million dollars and about 100 million dollars worldwide. The movie will have pretty stiff competition from The Transformers spinoff Bumblebee and Mary Poppins Returns. And speaking of Aquaman, Jason Momoa’s night on Saturday Night Live did really well. According to Deadline, his episode averaged a 4.3 live plus same day rating., This is an improvement from the previous week with Claire Foy. Her edition came n with a 4.1. The episode featured Momoa barefoot with pink pant, a bit on how Aquaman lacks a theme song and saw the actor reprise his role of Khal Drogo from Game Of Thrones. Real cool. Arrow star Katie Cassidy who plays Laurel Lance has gotten married. Katie has confirmed her marriage to Matthew Rogers on a post on her Instagram. The couple first got engaged back in June of 2017. Congratulations to the couple. Also recently hitched is The Flash himself, Grant Gustin and his girlfriend Andrea Thoma are now officially married, the couple held their wedding Saturday, December 15th, at the Valentine DTLA in Los Angeles. Congratulations to the Fastest Man Alive. We;re still a few weeks away from Season Two of The Orville and we have some good news that might help get that season three order. The Orville has been awarded a California TV tax credit to the tune of 15.8 million dollars, the production received a 14 million dollar credit for the second season. Now keep in mind that this doesn’t mean that one is definite, but a little credit does go a long way. Viewers of Frosty the Snowman have caught on to something interesting in the eternal christmas special. The biggest critique on the 1969 special so far is the choice of clothing on the children characters. Mainly that they appear to be wearing shorts in winter. Comicbook dot com listed some of the tweets, such as quote How does Karen get off the roof when Santa drops her off? And why are they wearing shorts and no coats in the snow? From @TexasTriplet Mom and While we’re all over analyzing holiday classics, let’s consider the outerwear selected for these children by their parents in this holiday classic from @beersjoshua. Of course let’s just point out that it’s just a cartoon. Perhaps the animators didn’t have enough ink to make full pants? A new report from Japanese Nintendo notes that two new trademarks have been filed for two Wii games Super Mario Galaxy and Metroid Other M with the other notes quote “Nintendo Co., Ltd. has applied for a Super Mario Galaxy (and Metroid Other M) trademark in Japan for purposes including ‘video game program’, ‘downloadable video game program’, and ‘program for smartphone’.” So does this mean that we might see these two games re released for switch or cellphone release soon? Only time will tell. The 2018 game awards happened. Let’s take a look at some of the winners. God of War won Game of the Year, Best Action/Adventure Game, Best Game Direction. Best Narrative, Best Audio Design and Best Score/Music went to Red Dead redemption 2 and well as Best Performance for Roger Clark as Arthur Morgan. Fortnite won for Best Ongoing game and Best Multiplayer game. Best Fighting Game went to Dragon Ball Fighter Z and Overwatch won Best Esports Game. Congrats to all the winners. Amazon Studios has announced plans to turn the illustrated novella The Refrigerator Monologues in a female empowered superhero show entitled Deadtown with Whip It screenwriter Shauna Cross Here’s the plot of the show. “Five recently-dead women meet in Deadtown, a purgatory where they discover that their entire lives were merely in service to the superhero men they happened to cross paths with, resulting in each of their deaths,” reads Deadline’s description. “Or in comic book terms, they were ‘refrigerated’ – frozen out of the story once they provided emotional backstory for the men. Until now. The Refrigerator Monologues was written by Catherynne M. Valenta and illustrated by Annie Wu, and was optioned by Entertainment One and Grey Matter Entertainment – who in turn, reportedly sold it to Amazon. Now word yet on a release schedule or production schedule for the show. From the what the hell file comes word from the Hollywood Reporter that Benicio Del Toro has signed on to be the voice of Swiper in the live action feature version of Dora The Explorer the movie wrapped up production in australia two weeks ago, but it’s not like you need the voice for the character in real life when filming live action. The movie stars Isabela Moner, as the teenage titular Dora, a girl accustomed to the jungle life with her parents and now forced to explore the uncharted terrain of high school and stars Michael Pena and Eva Longoria as her parents, as well as Eugenio Derbez, Adriana Barraza and Temuera Morrison, among others. Swiper no watching, swiper no watching,swiper no watching! Tonight we close out the show noting the passing of writer and producer John DF Black. John DF Black is best known as the writer of the original Star Trek Episode The Naked Time, he also wrote the Next Generation episode Justice under the nom de plume of Ralph Willis, he also received a story by credit for the episode The Naked Now. The Naked Time gave Black a Hugo Award Nomination. Outside of Star Trek Black’s credits include writing work on The Unearthly, Mr. Novak, the Cathy Lee Crosby Wonder Woman pilot, The Fugitive, Shaft, Charlies Angels and Murder She Wrote. He also directed and episode of Charlie’s Angels. In 1972 John won an Edgar Award from the Writers guild of America for Best TV Feature or Mini Series Teleplay for the tv movie Thief. John DF Black Died of natural causes and is survived by his wife Mary and his two sons. He was 85. That brings us to the end of another big show, I have a request of you, I’m planning a special show for the first one of 2019 and I would like you to tell me what geeky thing are you looking forward to in 2019, be it a show, movie, book or whatever. Record a message and send it to me or write and send it to feedback@multiversetonight.com. I’ve lined up an interview with my friend Jason Hunt about the return of SciFi4Me, but I’d love to have your input, please send it to me before Christmas Day.